For other uses, see Cup (disambiguation). A cup is an open-top container used to hold liquids for pouring or drinking; it also can be used to store solids for pouring (e.g., sugar, flour, grains). Cups may be made of clay, wood, stone, glass, metal, china, styrofoam, plastic, or other materials, and are sometimes fixed with a stem, handles, or other adornments. 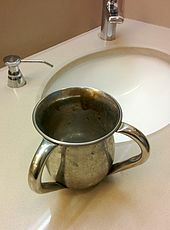 Cups are used for quenching thirst across a wide range of cultures and social classes, and different styles of cups may be used for different liquids or in different situations. Cups of different styles may be used for different liquids or other foodstuffs (e.g. teacups and measuring cups), in different situations (e.g. at water stations or in ceremonies and rituals), or for decoration. Cups are an obvious improvement on using cupped hands or feet to hold liquids. They have almost certainly been used since before recorded history, and have been found at archaeological sites throughout the world. Prehistoric cups were sometimes fashioned from shells and hollowed out stones. In ancient Mesopotamia, cups were made for a variety of purposes, possibly including the transportation and drinking of alcoholic beverages. There is evidence the Roman Empire may have spread the use of cups throughout Europe, with notable examples including silver cups in Wales and a color-changing glass cup in ancient Thrace. In England, cups have been discovered which date back to several thousand years, including the Rillaton Gold Cup, about 3,700 years old. Cups were used in the Americas several centuries prior to the European arrivals. Around the Gulf of Mexico, Native American societies used the Horse conch for drinking cups, among other purposes. Since cups have been an integral part of dining since time immemorial, they have become a valued part of human culture. The shape or image of a cup appears in various places in human cultures. Historically, monarchs have been concerned about assassination via poisoning. To avoid this fate, they often used dedicated cups, with cup-bearers to guard them. A "divining cup" was supposed to be able to detect poison. In the Bible, Joseph interpreted a dream for Pharaoh's cup-bearer, and a silver divining cup played a key role in his reconciliation with his brothers. Spa cups are a special cup used to drink mineral or thermal water directly from a spring, developed in north-west Bohemia during the 17th century and are now part of Czech folklore. In the Christian ritual of Communion, adherents drink from a cup of wine (or a wine substitute) to commemorate the Last Supper of Jesus. A chalice is often used for this purpose. Ancient Greek religious practices included libations. The rhyton was one cup used for libations. The measuring cup, an adaptation of a simple cup, is a standard tool in cooking that has been in use at least as far back as Roman times. Apart from serving as drinking vessels, cups can be used as an alternative to bowls as a receptacle, especially, for soup. Recipes have been published for cooking various dishes in cups in the microwave. Chalices are sometimes used in heraldry, especially ecclesiastical heraldry. A Kronkåsa is a type of elaborate wooden cup which was used by the Swedish nobility during the Renaissance. Drinking from a cup is a significant step on a baby's path to becoming a toddler; it is recommended that children switch from bottles to cups between six months and one year of age. Sippy cups are typically used for this transition. Many trophies take the form of a cup, often a loving cup. In sports, competitions themselves often take on the name of the cup-shaped trophy awarded. Many trophies take the form of a large, decorated cup. In cases such as the FIFA World Cup and the Stanley Cup, the competition itself may grow to take on the name of the trophy that is awarded to the winner. 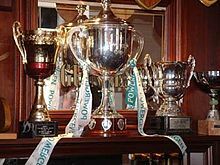 Owing to the common usage of cup-shaped trophies as prizes for the winners, a large number of national and international competitions are called "cups". In Tarot divination, the suit of cups is associated with the element of water and is regarded as symbolizing emotion, intuition, and the soul. Cards that feature cups are often associated with love, relationships, fears, and desires. Various cups have been designed so that drinking out of them without spilling is a challenge. These are called puzzle cups. The cup game involves rhythmically striking plastic cups. In the developed world, cups are often distributed for promotional purposes. For example, a corporation might distribute cups with their logo at a trade show, or a city might hand out cups with slogans promoting recycling. There are companies that provide the service of printing slogans on cups. Solo cups (especially red ones) carry strong cultural connotations, especially in America, generally referring to the consumption of alcoholic beverages. Disposable cups are intended to be used only once. They are often used by fast-food restaurants and coffee shops to serve beverages. Institutions that provide drinking water, such as offices and hospitals, may also use disposable cups for sanitary reasons. Some styles of cups are used primarily for alcoholic beverages such as beer, wine, cocktail, and liquor. There are over a dozen distinct styles of cups for drinking beer, depending on the precise variety of beer. The idea that a certain beer should be served in a cup of a certain shape may have been promulgated more for marketing purposes, but there very well may be some basis in fact behind it. Wine glasses also come in different shapes, depending on the color and style of wine that is intended to be served in them. ^ Producer Chris. "Radio 1 Movies Blog: Who Drank From This?". BBC. Retrieved January 26, 2014. ^ "Cup - Definition and More from the Free Merriam-Webster Dictionary". Merriam-webster.com. August 31, 2012. Retrieved January 26, 2014. ^ "Cup | Define Cup at Dictionary.com". Dictionary.reference.com. Retrieved January 26, 2014. ^ Producer Chris. "Radio 1 Movies Blog: Who Drank From This? The Answer". BBC. Retrieved January 26, 2014. ^ "What Are the Different Types of Coffee Cups? (with pictures)". Wisegeek.com. January 18, 2014. Retrieved January 26, 2014. ^ Rigby 2003: p. 573–574. ^ "The Archaeology News Network: Gold cup headlines Mesopotamia exhibition". Archaeologynewsnetwork.blogspot.com. April 24, 2012. Retrieved January 26, 2014. ^ "Roman Cup - Archaeology Magazine Archive". Archaeology. March – April 2004. Retrieved January 28, 2014. ^ Merali, Zeeya (September 2013). "This 1,600-Year-Old Goblet Shows that the Romans Were Nanotechnology Pioneers". Smithsonian. Retrieved January 28, 2014. ^ Norton, Elizabeth (August 6, 2012). "Starbucks of Ancient America?". ScienceNOW. Retrieved January 28, 2014. ^ "Genesis 40 ESV - Joseph Interprets Two Prisoners' Dreams". Bible Gateway. Retrieved January 26, 2014. ^ Kuchyňová, Zdeňka (May 2, 2008). "Lázeňský pohárek - typicky česká záležitost" (in Czech). Czech Radio. Retrieved January 15, 2017. ^ "Are You Drinking of the Master's Cup?". Cgg.org. Retrieved January 26, 2014. ^ "Coffee Cup Quiche". St. Louis Post-Dispatch. May 1, 2012. Retrieved February 9, 2014. ^ "Introducing a cup: 8 months and over". Heinz For Baby. Retrieved January 26, 2014. ^ Last reviewed: July 2012 (January 1, 2000). "How can I encourage my toddler to drink from a cup?". BabyCentre. Retrieved January 26, 2014. ^ "'win the cup' Google news search". Google. Retrieved February 3, 2014. ^ a b Burger, Evelin; Johannes Fiebig (2004). Tarot Basics. New York: Sterling. p. 76. ISBN 1402730403. ^ Tarantino, P.C. (2007). Tarot for the New Aeon. Pebble Beach, CA: Alternative Insights. pp. 245–246. ISBN 0976618400. ^ Ziegler, Gerd (1988). Tarot: Mirror of the Soul: Handbook for the Aleister Crowley Tarot. York Beach, Maine: S. Weiser. p. 191. ISBN 0877286833. ^ "The Cup Game". Great Group Games. Retrieved January 26, 2014. ^ "Custom Promotional Cups, Branded Plastic and Paper Cups". Custom On It. Retrieved January 26, 2014. ^ Chan, Casey (July 3, 2013). "The Red Solo Cup Gets Classy". Gizmodo. Retrieved January 28, 2014. ^ Ashby, Michael F. (September 23, 2016). Materials Selection in Mechanical Design. Butterworth-Heinemann. ISBN 9780081006108. ^ "Beer Glass Types". Truebeer.com. Retrieved January 26, 2014. ^ McClenehan, Robert L. Some Scottish Quaichs. Illinois, 1955, p. 3. Rigby, Stephen Henry (2003). A Companion to Britain in the Later Middle Ages (Illustrated ed.). Wiley-Blackwell. ISBN 978-0-631-21785-5.